Permanent Record: The orphan who became the matriarch of one of New York’s most powerful political families. How an orphan became the matriarch of one of New York’s most powerful political families. The old Manhattan Trade School for Girls report cards, which I found in a discarded file cabinet in 1996 (you can get the full story on that here), are filled with notations that present puzzles. 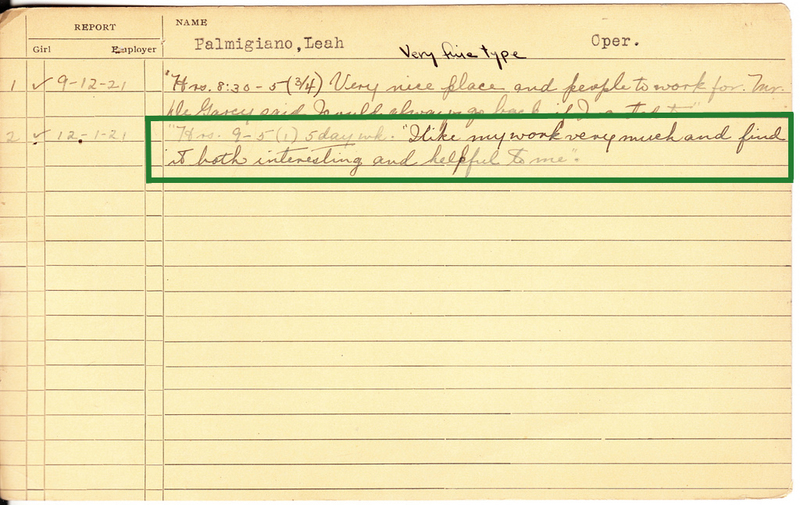 One of them appears on the card of a student named Leah Palmigiano, who began attending Manhattan Trade in December 1919. Her address was initially listed as 338 E. 14th St. in Manhattan but then was crossed out in favor of 337 E. 14th St. 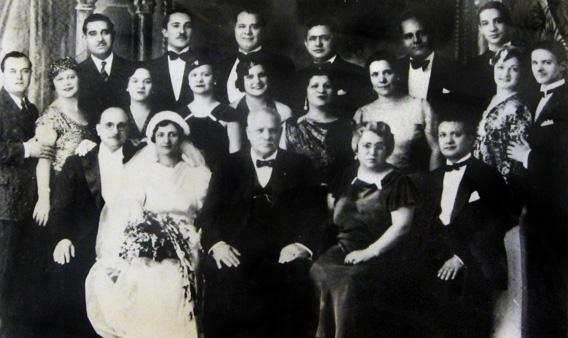 The Vallone family, 1935. Leah is in the center of the middle row, with the big smile. It’s not unusual for a Manhattan Trade report card to show multiple addresses for a student, since many of the families moved to new residences and the school often kept tabs on students even after they graduated. But I was intrigued by Leah’s address being shown as 338 and then 337—did her family simply move across the street, perhaps because they had relatives there? Or maybe her address was recorded incorrectly the first time, and then someone fixed it? Or was there some other explanation? As I recently discovered, Leah did indeed move across the street during her time at Manhattan Trade. It was a move necessitated by tragic circumstances and one that changed the course of her life. It also led to one of the greatest success stories to emerge so far from the Permanent Record project. Peter Vallone is a familiar name to those who follow New York politics. He was a member of the City Council from 1974 through 2002 and spent more than half of that span serving as council speaker—the second most powerful post in the city after the mayor. In 1998 he was the Democratic Party’s gubernatorial candidate, losing to the incumbent, George Pataki. Although Vallone is now retired from politics, his name still circulates in public life thanks to his son, Peter Vallone Jr., a city councilman from Queens who’s generally assumed to have ambitions for higher office. 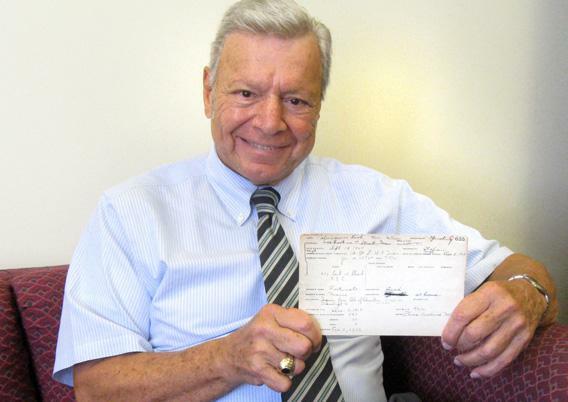 Now 77 years old but still active as an attorney and consultant, the senior Vallone maintains an office near his longtime home in Astoria, Queens, and another one in the historic Woolworth Building near City Hall in Manhattan. He recently agreed to meet with me at the Manhattan location, where we discussed the life of his mother, Leah Palmigiano Vallone—the Manhattan Trade School student who moved across the street. 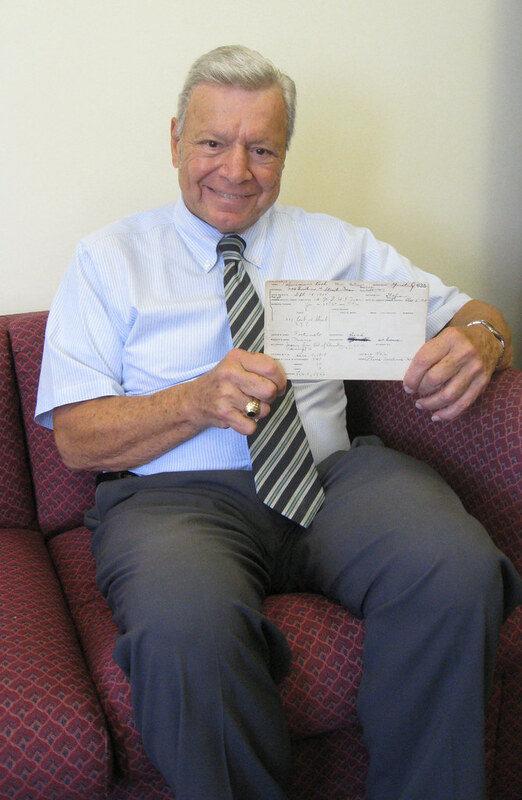 Peter Vallone holding the report card of his mother, Leah Palmigiano Vallone. 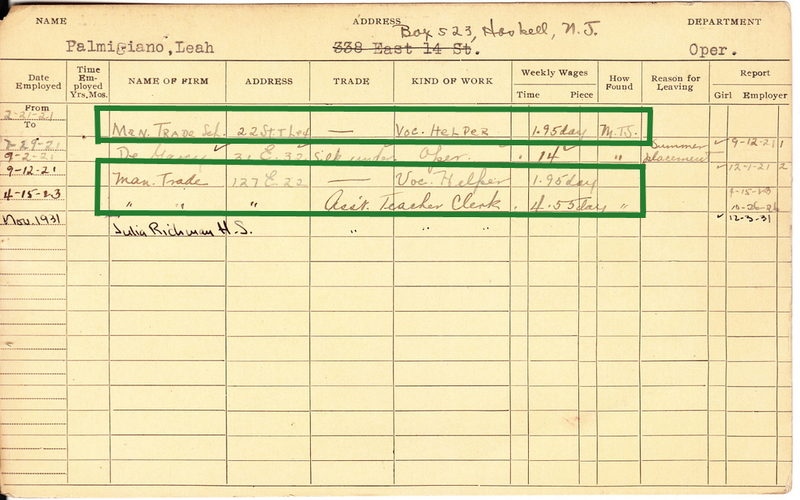 This would have been around 1920, when Leah was still attending Manhattan Trade. She and her older brother were now orphaned, but help was available from another Italian family in the neighborhood—the Vallones, who lived across the street. 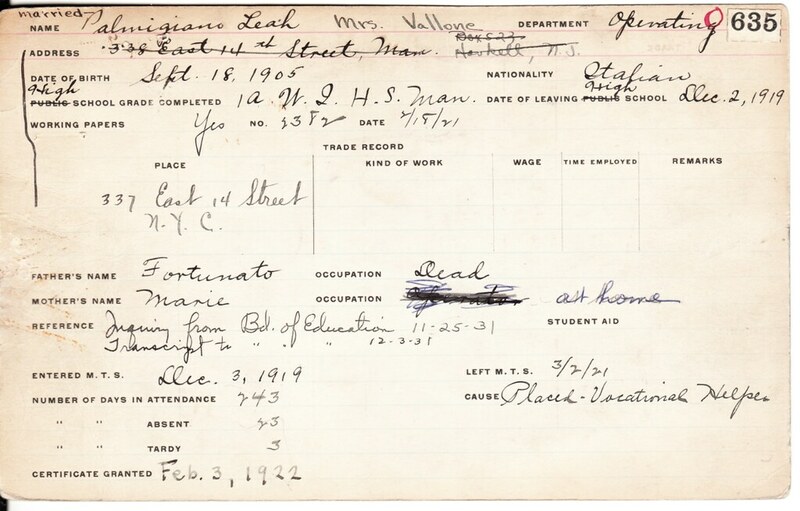 None of this drama is documented in Leah’s school record, which is surprising, given that many of the Manhattan Trade report cards include extensive notes about the students’ home and family situations. In any event, it must have been an extremely difficult time for Leah. Aside from dealing with the grief of losing her remaining parent, she had to adjust to a new family culture that was very different from what she’d been used to. Her family was small and reserved, while the Vallone clan was large and boisterous. “The Vallone family had a big love, an embracing love,” said Peter. “Whereas my mother, she was more introverted. Even later in life, she loved her immediate family, but her feeling regarding the extended family was more, ‘You live your life, I’ll live mine.’ ” Maybe that came from spending her teen years in a family that wasn’t her own, or maybe it was just her nature. Despite all this turmoil, Leah’s report card shows generally good grades and positive teacher comments. She apparently made a positive impression on the staff, because Manhattan Trade hired her as a vocational helper and an assistant teacher clerk after she completed her trade training. That must have been a plum job compared to the grueling garment factory work that most of the girls ended up with, and it put Leah in a fairly elite club: Of the nearly 400 Manhattan Trade School students whose report cards are in my collection, only a handful were hired to work at the school. She apparently enjoyed the job. 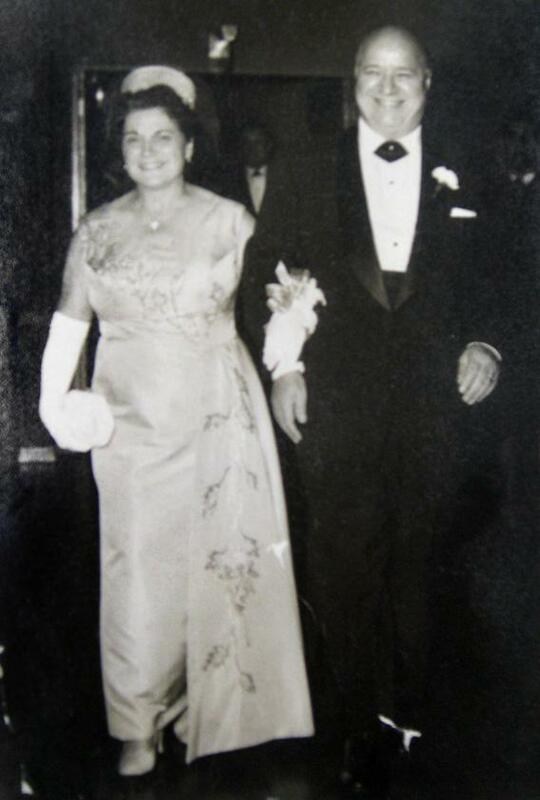 Leah and Charles Vallone, date unknown. Meanwhile, Leah had found more than a new home when she moved to the other side of 14th Street. One of the brothers in the Vallone household—Charles Vallone, who was a few years older than Leah—had taken a liking to her, and the feeling was mutual. They courted while Charles went to college and law school and were finally married in 1928. In 1931, they moved to the Queens neighborhood of Astoria. “I still live half a block from that apartment house today,” said Peter. As Charles worked for a bank and then a law firm and Leah worked as a principal’s assistant and substitute teacher at a high school in Manhattan, the two of them slowly began getting involved on the organizing level of local politics. For Charles, this came easily—he was naturally gregarious, a glad-hander. But how did Leah, with her more reserved demeanor, get involved? Peter himself seems to fall somewhere in between, at least at this stage of his life—outgoing but also patient, letting the conversation come to him. A hint of his younger, presumably more boisterous self came when I asked him to pose for a photo with Leah’s report card, at which point he instantly flashed the electric smile of a career politico. Once a candidate, always a candidate. An unfortunate thread running through Leah’s life is the death of most of the men she was close to, usually at an early age. Her father passed away when she was still a girl; her brother, who had settled in Pennsylvania but with whom she was still very close, died of a heart attack while in his late 40s; Charles, her husband, died in 1967 at the age of 66. But the biggest blow came one night in 1975, when her son Buddy—Peter’s older brother—was killed by a hit-and-run driver in Astoria. He was 42. 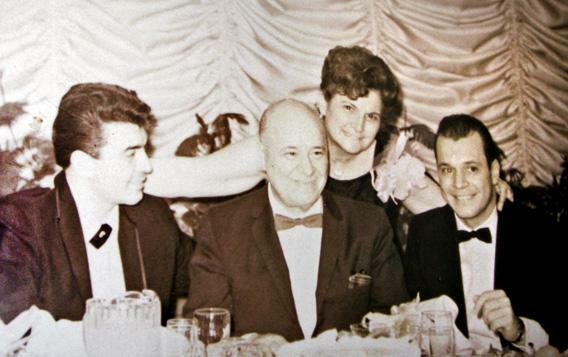 Leah and Charles Vallone with their sons, Buddy (far left) and Peter, right, circa 1960s. Peter had to deliver the news to Leah the following morning, which he called “the hardest thing I’ve ever done.” Later that day, Leah fainted, fell, and broke her ankle, triggering a physical and mental deterioration that played out over the ensuing decade. She passed away in January 1985 at the age of 79. Although the earliest and latest chapters of Leah’s life were difficult, Peter said the times in between were happy ones. And while there are other students in my Manhattan Trade School report-card collection who went on to have brushes with fame (Eva Greene Rosencrans, for example, designed Mamie Eisenhower’s inaugural ball gown), I’m not aware of any students whose children achieved a public profile to rival Peter Vallone’s. When you add up the political careers of Charles, Peter, and Peter Jr., Leah shapes up as the de facto matriarch of what has become a New York political dynasty—an impressive achievement for an orphaned daughter of Italian immigrants and a classic example of the American dream made good. For Leah, that dream started when she left behind her old life at 338 E. 14th St. and moved across the street to 337. I was curious to see what those addresses looked like today, so I recently went out to the East Village to have a look. 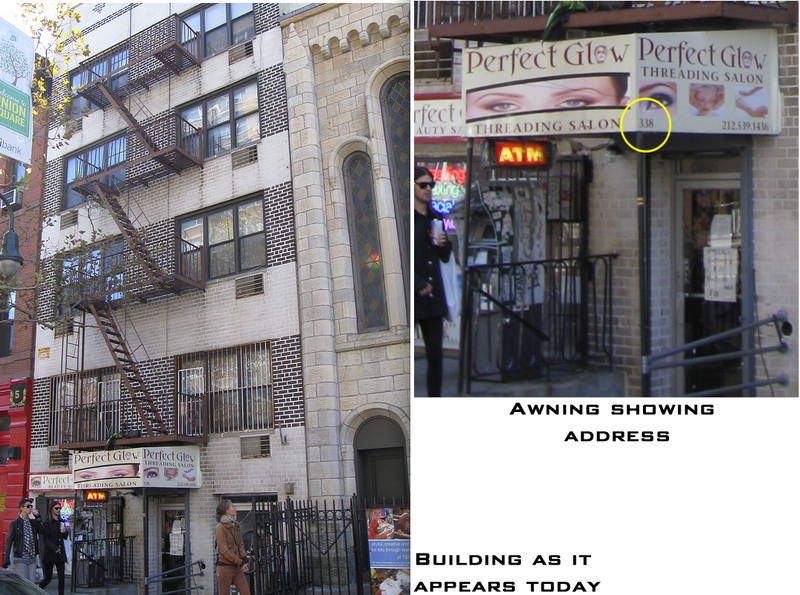 At 338, where Leah’s family lived, there’s a five-story building with a beauty salon on the ground floor. But Leah’s family lived here a nearly century ago—it may be the same address, but is it the same building? 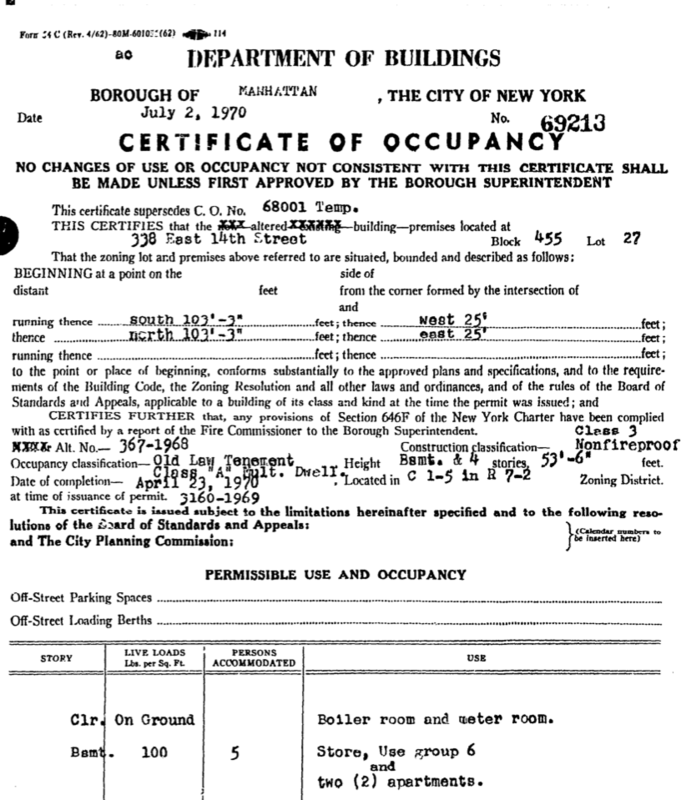 The building’s certificate of occupancy, available via the Department of Buildings’ website, describes it as an “old law tenement,” which means it was built between 1879 and 1901. So yes, this is the building where Leah was living when she began attending Manhattan Trade in 1919. Across the street, however, there have been changes. A large, modern apartment complex sprawls out across several lots in the middle of the block. Its address is 333, and the next building to the east is 347. So 337, where the Vallones lived when they took Leah in, no longer exists. The symbolism, however, remains intact: The old building at 338 represents the past, while the modern building across the street represents new life, a fresh start, progress. That’s certainly how it turned out for Leah. This will be the last Permanent Record article on Slate, at least for a while. (We may run additional entries as developments warrant.) 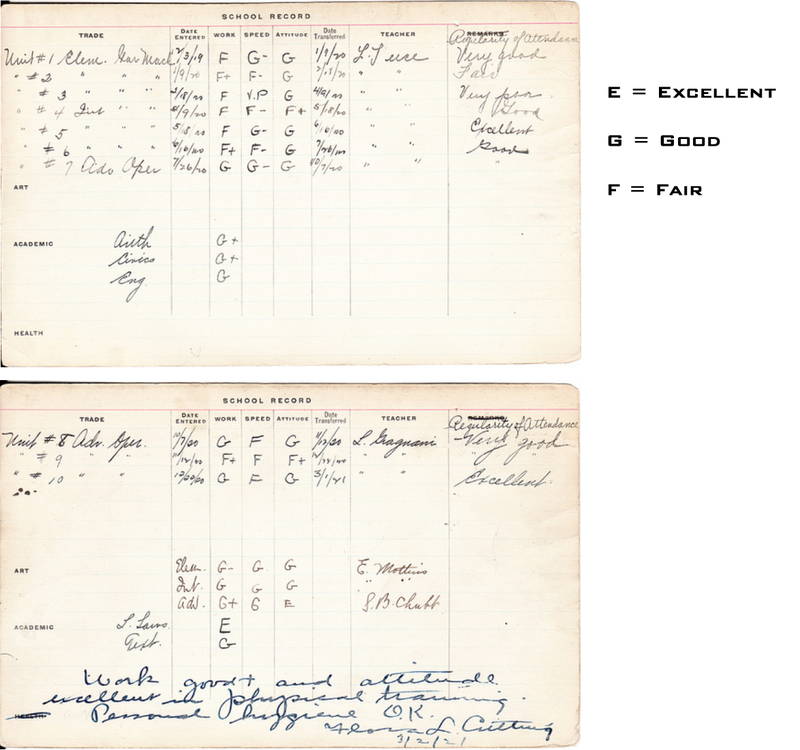 But you can still keep up with the project over on the Permanent Record Blog, where I’ll continue investigating the Manhattan Trade School report cards, along with other found objects that have stories to tell. You can also sign up for the Permanent Record mailing list by sending me an email. My thanks to all of Slate’s readers for your support and enthusiasm—it’s been a privilege to share these stories with you.